Romney Ryan campaign: It's the budget, stupid. It’s the Budget, Not the Economy, Stupid. Ryan has distinguished himself as a proponent of fiscal probity. It’s the budget, not the economy, stupid. That variation of the 1992 slogan that propelled Bill Clinton into the Oval Office may now apply to Mitt Romney’s candidacy. The Republican presidential wannabe’s choice of conservative House budget chief Paul Ryan as his running mate has the power to transform a heretofore mealy campaign into something substantive: a referendum on fixing the American balance sheet. It’s pathetic that it has taken the nomination of a 42-year-old Wisconsinite from Congress to give Romney’s candidacy much appeal, even to his base, beyond the simple fact that he is not Barack Obama. But at a time when debt crises threaten the sovereignty of developed nations and the U.S. fiscal picture is about as bleak as it has been has outside of wartime, righting the country’s finances is the stuff of long-term legacy creation. Despite his relative youth, Ryan has spent 13 years in the House, neutralizing arguments that he’s unprepared for the post. Though that includes the Bush era, when Congress was at its most profligate, Ryan has since distinguished himself as a proponent of fiscal probity. His recent counter-proposal to the White House’s budget was a serious attempt to propose constructive fixes to vexing long-term economic problems. Elements of Ryan’s plan, particularly deep cuts to entitlement and Medicare spending, offer the Democrats a distinct target. But that’s a necessary debate for the country to engage in. For Romney, too, it’s a better issue to campaign on than a half-hearted defense of the GOP’s more recent obstructive record in Congress. Moreover, whatever either candidate says on the stump, tangling with America’s finances will be the chief legislative task of the new president. Congress will not find a solution to the so-called “fiscal cliff” of some $450 billion of tax increases and $1.2 trillion of spending cuts that take effect from 2013. In all likelihood, a lame-duck legislature will extend the implementation of these into the first half. That requires a leader capable of shaping a grand compromise to knotty fiscal predicaments, one that takes a European-style crisis off the table. It is going to require shared sacrifice, including meaningful spending cuts and a fairer tax code. Done right, a long-term budget deal creates confidence, lifts economic growth and puts the unemployed back to work. 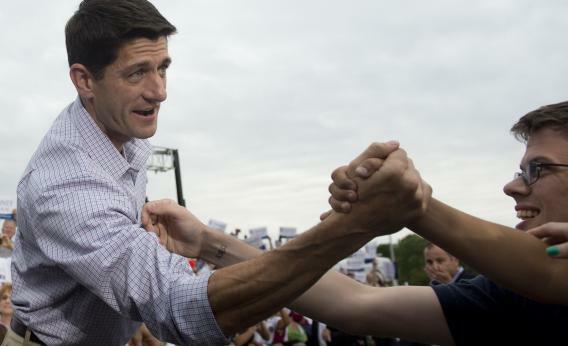 Ryan may not have all the right answers, but his arrival on Romney’s ticket at least gets the conversation started. Read more at Reuters Breakingviews.